Sometimes, a tooth cannot be restored. In these instances, a permanent replacement tooth is necessary. If a damaged tooth is still present, it will be removed completely, and then a dental implant will be placed. An abutment and crown that fits over the implant will look and act like your natural tooth once did. To begin this process, your prosthodontist will thoroughly examine your teeth and gums and evaluate bone density and quantity. 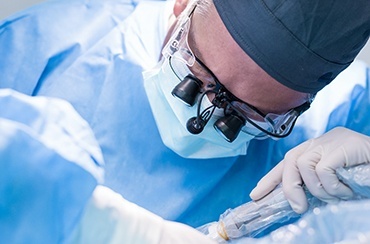 This may involve X-rays and computer tomography scans (CT scans) to ensure there is sufficient bone structure for placing the implant(s) and to determine exactly where the implant should be placed. There are a number of dental implant treatment options. 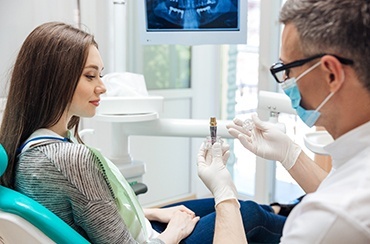 Based on the condition of your oral tissues, oral hygiene, and personal habits along with other factors, your prosthodontist will advise you of the most appropriate dental implant treatment plan. Among the options available are conventional implants, mini implants, and teeth in a day where a crown can be placed on the same day as the implant. Once a plan has been decided upon, your prosthodontist will advise you as to how long the entire treatment process will take, how many appointments will be necessary, and what you can expect after each procedure. 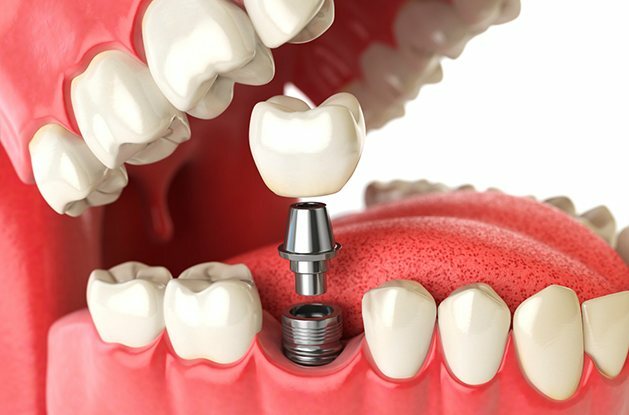 When replacing teeth with dental implants, the first major step of the procedure is to have the implants themselves surgically inserted into the jawbone. While most general dental practices have to refer their patients to a separate office for this service, EMA Dental brings the specialists to you instead, keeping every stage of treatment in one convenient location. Once the implants are secured within the jawbone, a period of healing commences. Your natural bone and tissue will gradually form around the implant, setting the stage for your eventual restoration(s). Once your dental implant has successfully healed within the jawbone, it will be time to complete a patient’s new “tooth” with a custom-made restoration. If only a single implant/tooth needs to be rebuilt, our practice offers implant-retained crowns and bridges. These new smile additions will look beautifully lifelike and feel right at home alongside your natural teeth. An implant-retained denture is a cost-effective way to use implants (two to four implants) to retain and stabilize a removable full or partial denture. Patients report a 100% improvement in comfort and functionality over conventional removable dentures. Like the name suggests, mini dental implants are simply a smaller version of traditional implants. Our team is likely to recommend this service for patients who want to use implants to retain a denture and/or don’t have enough healthy jawbone density in certain areas of the mouth to support a traditional implant. The cost of mini implants is also more affordable, and patients will recover on a faster timeframe from their surgical placement. Traditional reconstruction with dental implants is a multi-appointment process that typically takes months, and patients may be without a full set of capable teeth during that time. If you’re interested in a speedier timeframe, talk to our prosthodontists about the possibility of undergoing accelerated treatment! Also known as TEETH-IN-A-DAY™, this state-of-the-art procedure enables us to both place implants and restore them during the very same appointment.